In the past few years, videos have started taking over—and it’s easy to see why. They stimulate both the visual and auditory senses while packing a wealth of information into a short span of time. Videos are also very diverse in their application. From providing entertainment to educating to expressing your opinion to marketing a product, videos are a powerful tool. When it comes to your business, videos can offer a great boost in exposure and engagement. But why should the consumer trust you enough to click “play”? After all, they want knowledge, but they also want it given impartially. Here’s where user-generated videos come in. They provide another voice for your company with no agenda or ulterior motive. We live in a world of instant access and many options of how to express ourselves. Feelings are tweeted, images are Instagrammed, posts are Facebooked, and pins are uploaded millions of times a day. If someone has an opinion, you better believe that it will be accessible to the entire internet community within minutes. For better or for worse, this is an outcome from our advancements in technology. It’s a reality that your brand should not only be aware of but also embrace. As a brand, it is your responsibility to keep tabs on the content that is generated about you. This includes video. Mention is a great tool for that, as it not only tracks keywords, but also gives you analytics on what gets shared the most and lets you track your competitors. Great for tracking videos and comments alike, Mention can help you follow whoever’s following you. When it comes to social media, user-generated videos offer tremendous potential for shareability. Videos have the potential to go viral or for the person broadcasting the video to bring a huge following to your product. Just take a look at UGC videos that are enhancing the enhancing the news and helping teach new cooking tips. Social media also provides the perfect platform for creating fun competitions and contests. Let’s say that you work for company that creates art supplies. If you run a campaign offering free supplies to the user who uploads the winning video documenting the creation of a work of art, it not only encourages and motivates your consumers, but also gets your company’s name out there. Plus, your business has now cultivated a library of UGC videos that can be used for marketing purposes. When your company says, “Hey, look at how cool our product is,” the message may or may not be received, regardless of how cool your advertisement is. But when someone else says, “Wow, check out this cool thing I just found,” people are much more likely to listen. In fact, a whopping 84% of millennial consumers reported that UGC has an influence on what they buy. Why is that? Obviously, the brand has a tremendous amount to be gained by promoting their product. They have a vested interest. But users don’t. Users make videos purely for the sake of entertaining and educating. It is much easier to trust someone who isn’t trying to sell you something. Only last month, I was shopping Amazon for a new cell phone case and had narrowed it down to two options. I read the reviews, compared the specs and prices, but still was on the fence. I discovered that one of the cases had a video review on their merchant page, so I clicked it. Seeing the way that the case looked in real life (rather than in a static image), listening to the description of the case, and watching the video creator put the case on the phone really sold it to me. The fact that he was explaining the product in a non-biased way made me trust that he was telling the truth about it. Based on the video, I chose that phone case over the other one (It’s great, by the way). 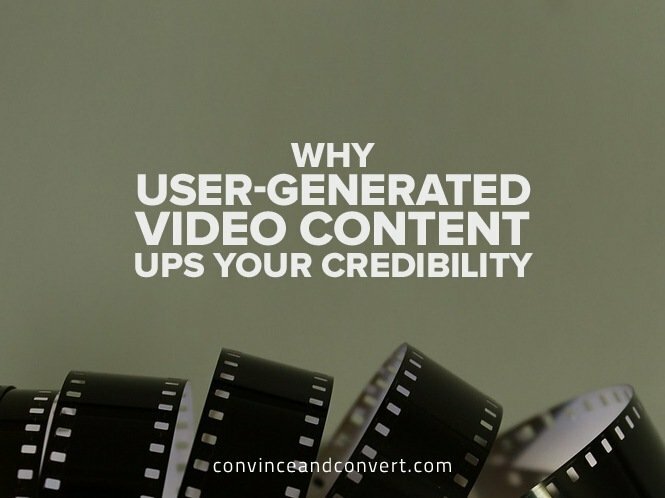 With UGC videos, each user is a unique person and offers an original perspective. Take, for example, Unbox Therapy. Started by Lewis Hilsenteger as a hobby, he “unboxes” different products and reviews them. This YouTube channel “where products get naked” is the epicenter of user-generated content videos. You can tell that it works based on the 3.75 million subscribers that he has. Considering 70% of consumers trust peers over businesses, if your product were to be featured in one of his videos, your sales might just skyrocket. Hilsenteger has used his personal voice and the power of his opinion for the betterment of your business. Doubling down on video content also creates a sense of familiarity for the consumer. Comscore found that when paid content was combined with UGC, the conversion rate went up by went up by 28%. Content created by other users is highly valuable in terms of creating your brand seem credible. Don’t forget, however, that it’s also your responsibility to ensure that you’re working to get the word out about your product as well. There are many opinions out there blaming the death of brand marketing on user-generated videos. After all, there is much more user-generated content out there than there are brand marketing videos. But I disagree. These videos provide free marketing and publicity for your product. In fact, 78% of B2C companies plan to launch user-generated content this year. Of course, the popularity of UGC videos increases the risk of negative exposure, but on the whole, user-generated content offers audience-trusted insight into your brand’s integrity and reliability. In the marketing world, these videos can boost your brand’s image, make your company look more dependable, and even provide you with content for your next marketing campaign. In a world of instant accessibility, why not take advantage and utilize that accessibility to better your business? Ariel Shemesh is the CEO of WebyClip, a platform for Videotized Shopping Experience. He is a passionate leader with experience assisting ecommerce organizations. Ariel invented several patents in the telecommunication field, winning the Israeli Ministry of Health Innovation Award for a pro-bono project at one of Israel’s leading hospitals.